You are invited to our Nutrition Fair! This health education event will offer nutrition education for families as well as a Farmers Market. Come to receive Farmers Market coupons, healthy recipes, dental screenings, play fun games, meet and greet our team, and MUCH more! The Mobile Food Bank will also be there! 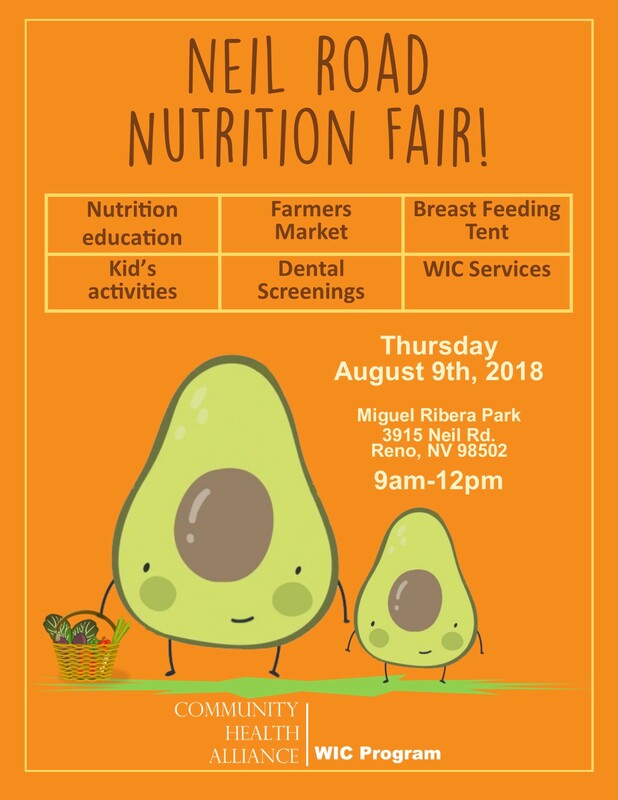 Come have fun with us on Thursday, August 9th, 2018 at the Community Health Alliance Neil Road Center (Miguel Ribera Park) from 8am-12pm. Community Health Alliance (CHA) is hosting its seventh annual Wine & Ribs fundraiser on Saturday, August 25 at 5 p.m. at the California Building at Idlewild Park in Reno. Proceeds will benefit low-income and uninsured northern Nevadans to aid in the mission of CHA to provide quality, affordable, comprehensive health services to all. Wine & Ribs will feature offerings from Famous Dave’s Bar-B-Que, 25 wine varietals from Whispering Vine Wine Co., and live entertainment from The Reno Jazz Syndicate, plus a special guest. Returning this year will be a silent auction featuring unique experiences. Details to come…. The price is all inclusive: $65 in advance, $70 at the event includes wine tasting, all you can eat ribs and the fixings, delicious desserts, and sensational entertainment. Please call 870-4356 for more information and to help sponsor the event. We have a variety of sponsor opportunities available.